Two of the most common connectors used for professional audio are the XLR connector and the 1/4" phone connector. Both have 3 conductors, useful for handling both phases of a balanced line, plus a shield. Why do most professional audio systems use balanced lines, you might ask. See below for an explanation. However, there is a large amount of equipment in the US that has pin 2 and pin 3 reversed (i.e., pin 2 Signal- , pin 3 Signal+). When in doubt, read your manual. Since the AES standard AES 3-1992 the three-pin XLR connector is also the standard connector for AES/EBU digital connections (electronically balanced, impedance 110 ohms). Also, Switchcraft offers a "mini" version of the XLR connector, called the Tini Q-G.
For typical balanced lines using 1/4" phone connectors, you should connect the positive phase signal line (hot) to the tip, the negative phase signal line (neutral) to the ring, and the shield to the shield. 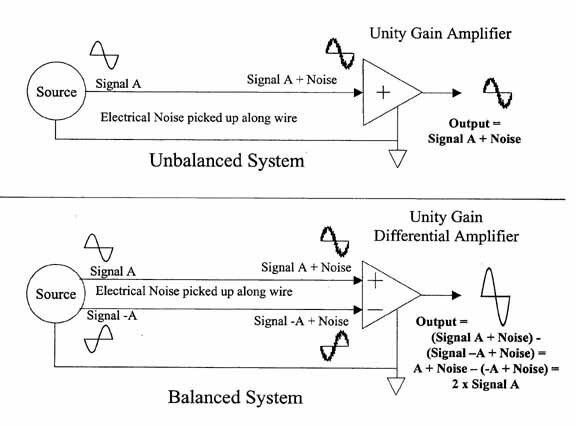 An unbalanced audio system consists of a signal source with a single output referenced to ground (see "Unbalanced" figure below). The signal comes from the output of the source, through the center conductor of the wire to the input of the receiving amplifier. The foil or braid shield around the wire provides the return path for the signal and also protects the center conductor to some extent from electrical and radio interference. Noise is added to the signal (from external sources) as it travels along the wire, because the wire essentially as as an antenna. The resulting output from the receiving amplifier consists of the signal plus the noise. This noise might be so small that it can't be heard above the signal. In some cases it is significantly louder. A number of factors affect the noise level, including length of cable (the longer, the more noise it picks up), the effectiveness of the shield and the particular characteristics of the environment in which it is installed. A balanced system is a little more complicated. Instead of a single conductor plus a shield between the signal source and amplifier, there are two conductors plus a shield. One conductor carries the main signal, while the other conductor carries the inverse of the signal (180 degrees out of phase). The two together are referred to as a "differential" signal. As this differential signal is passed through the wires, they pick up the same noise as the unbalanced signal does. By the time it reaches the amplifier, both the positive and negative signals have the same noise added to them. Keep in mind however that although the two source signals are 180 degrees out of phase with each other, the noise is in phase. These wires are connected to a differential amplifier which subtracts the out of phase signal from the in phase signal. In the diagram below, these signals are referred to as "-A" and "A" respectively. When they are processed by the amplifier, the output is equal to A - (-A) which equals 2A. Because the noise on the two lines is in phase, it is subtracted from itself and thus cancels itself. This means that the signal has doubled and the noise has been canceled out to zero. Also, note that to avoid ground loops, many audio engineers do not connect the shield at both ends (for example, connecting the shield at console, but not at the remote device). If you experience excess hum in your audio installation, it may be due to improper or inconsistent grounding. Connect Signal+ of the balanced signal to the "hot" pin of the unbalanced signal connector. Connect Signal- of the balanced signal to the "ground" pin of the unbalanced connector. Connect shield of the balanced signal to the "ground" pin of the unbalanced connector, or if hum is added by doing this, leave the shield unconnected at the unbalanced end. Allen Avionics - Check out the AGL-10K and the AGL-600. Lundahl- See part numbers LL1584-3FX3MX, LL156X-PHF3MX, etc. Rane - See the LT22. Rane - See the Balance Buddy BB44X and the B22. Rolls - Audio accessories of all sorts. Whirlwind - Check out the new pcDI. If you want to know more about level conversions, see Decibels.